Stained to murky water, with a variety of shallow emergent aquatic vegetation and isolated laydowns, provide plenty of cover for fish. The structure along the dam holds a variety of fish species, as well as artificial brush piles which have been placed within the lake. Largemouth bass can be caught using spinner baits, buzz baits, and plastic worms fished through and around vegetation at 1- to 4-foot depths. Shallow-diving crank baits can also be productive. Channel catfish are caught by drift fishing or tight lining with stink bait or shad. 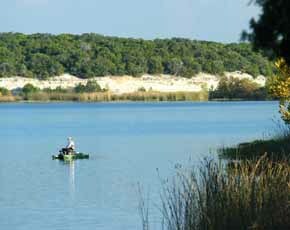 Crappie can be caught from shallow brush piles on live minnows or jigs Sunfish are caught on live worms and crickets around shallow brush and riprap.